So this year was my first ALA, which is one hell of an experience. I’m pretty sure there were more Librarians in the exhibition hall in one hour, than live in the whole of NZ. I flew out to New Orleans via Santa Barbara, which was just as well given the mess the ash cloud made with my flights. Brendan and I arrived in New Orleans just after midnight on Friday morning. 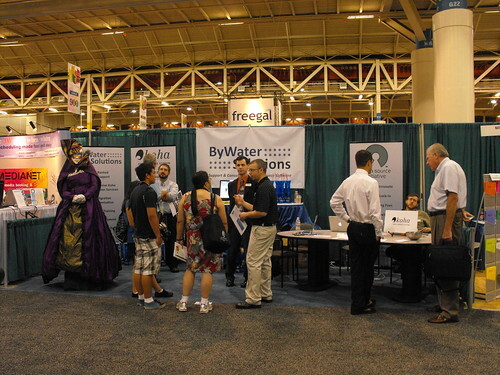 We spent the day, along with other ByWaterians working our way through bugs and enhancements, then the exhibition hall opened at 5pm. It was really busy, as the picture above shows, we always had a lot of people to talk to. So much interest in Koha from libraries and consortia big and small. It was very refreshing that most people understood Free Software, and we didn’t have to spend time explaining that. Also refreshing was the lack of questions on things like scalability, Koha has well and truly proven itself in that regard and people there seemed well aware of it. Most questions were around support, what new features we had in the pipeline and the differences between Koha and the most prominent fork. For the next 3 days I alternated with time on the stand and time meeting people and doing some hacking. I even managed to attend one session (Open Source ILS in Consortia) which was really good. It was a panel discussion, with 2 Evergreen and 3 Koha consortia represented. Ian and I even got a shout out which was neat. Saturday morning was the LITA open source Interest group meeting. It was a small affair but very good. On Saturday night we had the Open Source ILS users get together which was great fun, lots of cool people to talk to. Afterwards we did a walk up and down Bourbon Street, which is certainly something to behold. On Sunday night we ran a small hackfest, the highlight of which was spending time with the guys from IndexData and learning more about the internals of Zebra. Invaluable information was gathered. Monday, I managed to catch up with Marshall Breeding for a good 1.5 hour chat. We covered a lot of topics, Kotui, Libwebcats, development processes and much more. It was a great chat and one I hope we get the chance to repeat. That evening we went for a cruise on the Mississippi on a paddle steamer, so much fun. Tuesday morning back to Santa Barbara, for a lovely evening of barbeque elk and spare ribs grilled by Brendan, followed by a movie and a great night of sleep. Wednesday, the long slow journey back to NZ began and by 12:30am Saturday morning I was back at home. I spent a lot of time in airports, on buses, trains and planes but it was worth it. A huge thanks to ByWater Solutions for making it all possible for me to attend, and to my work (Catalyst) for letting me go.